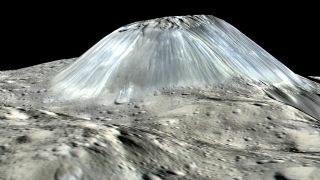 The only mountain peak on the dwarf planet Ceres, the ice volcano Ahuna Mons, may be slowly spreading out and sinking into the crust. In this simulated perspective view, the elevation of the peak has been exaggerated by a factor of two. The solitary mountain on the dwarf planet Ceres may be slowly disappearing, following in the footsteps of earlier peaks. New research suggests that the outer layer of the icy world may be slowly shifting over time, allowing the peak to gradually stretch out and sink into the crust. Similar mountains may have peppered the planet in the past and flattened out over time. Sori is lead author on a paper proposing that the mountain, called Ahuna Mons, may be slowly spreading outward due to its viscosity. He presented the results in March at the Lunar and Planetary Sciences conference in The Woodlands, Texas. When NASA's Dawn mission arrived at Ceres in 2015, it found a nearly flat world with only a single mountain, Ahuna Mons. The massive summit towers 2.5 miles (4 kilometers) above the surface and is at most 200 million years old. Previous research has suggested the peak could be an ice volcano — forming through the process of cryovolcanism, or flowing ice — but its source is still under debate. The mountain's isolation has been a major puzzle for scientists since Dawn first spotted it. Other icy worlds suspected of hosting cryovolcanoes, such as Pluto and the moons Europa, Triton and Titan, have multiple suspects. Ceres has only one. According to Sori, one possibility is that cryovolcanism was dormant on Ceres until fairly recently — although he calls that an unlikely scenario. "It's just odd to think of a thermal history of a planet where that would happen, where you would have it be dead for most of its history and then just yesterday, relatively speaking, become active," he said. "It's a weird thermal history to think about." The other, more likely option is that cryovolcanoes formed throughout the planet's lifetime, then disappeared. Because Ceres lacks an atmosphere or running liquids on its surface, the erosion processes of wind and rain that wear down Earth's mountains don't happen on the tiny world. Sori and his colleagues focused not on the formation of the mountain but on what happened afterward. They modeled possible compositions for Ahuna Mons and found that, if at least 40 percent of the mountain was made up of ice, it would slowly spread outward like honey on a plate, gradually relaxing or flattening down over time. With more ice, the mountain became more viscous, wavering between solid and liquid. "Our stuff takes place after the initial emplacement process, so we can be a little bit agnostic as to how the mountain formed in the first place," Sori said. "The key is, it just needs to have enough ice to experience this viscous relaxation." Cratering records provide one method for calculating the age of a terrain. While Ahuna Mons itself lacks signs of impacts, the region it sits in has craters that provide a limit of about a billion years for the mountain, previous research has shown. Sori's team came up with an even younger age if the precipice is relaxing. If the peak is half ice, it would take 500 million years to relax away after formation, he said; if it is completely ice, it would vanish within 20 million years of its birth. "Ahuna Mons is young, no more than 200 million years old," Sori said. Its youth suggests that the planet may still be geologically active today, though no definitive signs have been spotted by Dawn. The new work was detailed in February in the journal Geophysical Research Letters. A view of Ahuna Mons, the only mountain peak on Ceres, as captured by NASA's Dawn spacecraft. Ceres may be the lone peak today, but there's evidence that another spire may have risen in the past. Near Ahuna Mons lies the shape of another hill, spotted by a previous team. This may be the remnants of a previous cryovolcano like Ahuna Mons that gradually relaxed away, Sori said. "Maybe it was emplaced in the same shape [as Ahuna Mons] but flowed into its current shape over a few hundred million years," he added. That could suggest that the region around Ahuna Mons may be an ongoing source of cryovolcanism. On Earth, shifting plates cause lava to erupt through the crust in multiple locations, often spawning chains of volcanoes, but Ceres has no plate tectonics. Sori said the region could be more like Mars, where rocky lava continued to pile up on itself to create the massive Olympus Mons, the largest known volcano in the solar system. But while Ahuna Mons may be relaxing due to ice, the rocky Olympus Mons stands firm. Sori and his colleagues plan to search other images of Ceres for signs of potentially relaxed cryovolcanoes.